Whether or not you believe it's someone's destiny to find there passion, there are some uncanny instances that are just too obvious to pass up. Take for example Michelle Manier, the nineteen year old (no, it's not a misprint, she's only 19!) President & Founder of Manier Collections. Her father Eric Manier had been designing furniture and clothing for thirty years. So Michelle was bound to take over the design empire but she's trying to take it to new heights. When I met Michelle again, we've visited her before at the launch of Design Gallery, there was cool resolve to her. She's just as bubbly as any other teenager but her calmness and maturity are on fully display when describing her ultimate desire - making an impact on the fashion world. 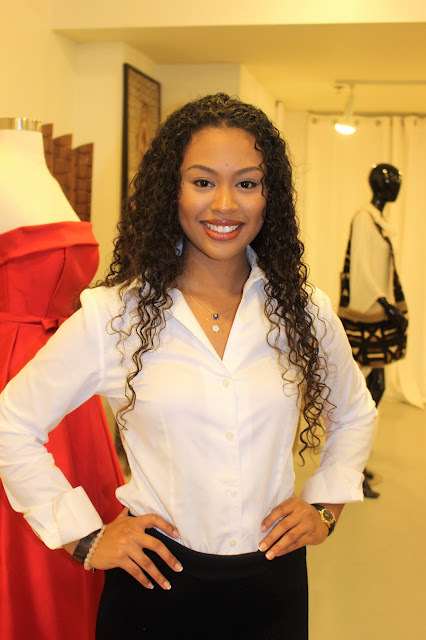 Still attending college for her business degree, Michelle has sharpened her eye for style with combining her real life experiences being of mixed heritage - Filipino and African American- and her affinity for classic looks. Her fingerprints are all over the new designs of handbags, everyday-wear, and the breathtaking couture dresses. For 2017 you will definitely see Manier Collections at Fashion Shows across the country. With a fresh perspective and outlook Michelle Manier will definitely make that dream come to fruition.